The name Ekajati literally means "one whose hair is arranged in single chignon." It is evident from the hairstyle of this image that the artist has faithfully followed this precept. Ekajati is most often portrayed as a ferocious goddess, her awesomeness being emphasized by the pronounced and only eye in the center of the forehead. 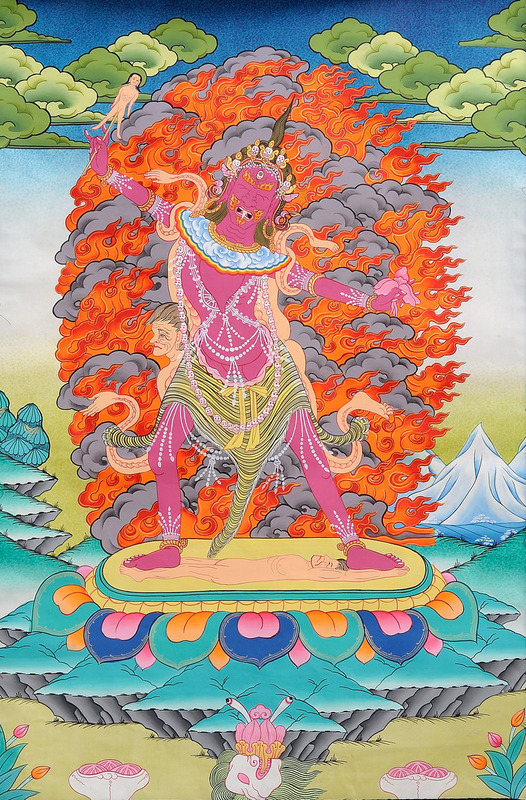 Ekajati is also known as Ugra-Tara, 'ugra,' meaning wrathful in Sanskrit. 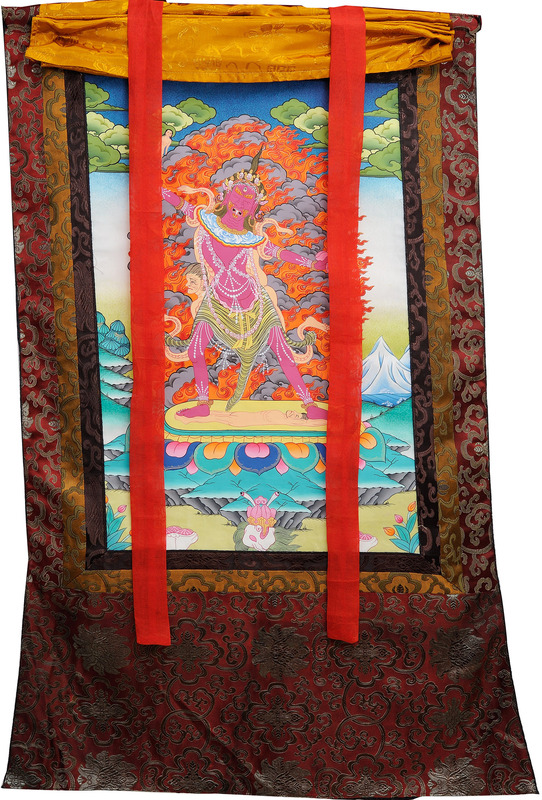 She is believed to be the most powerful goddess in the Vajrayana pantheon, and merely listening to the chants of her mantra destroys all obstacles, brings good luck and intense religious enjoyment. Dark and menacing, flame-enhaloed, and nearly naked, Ekajati's face contorts with fury. From her ugly mouth, a single fang protrudes. She has only one drooping breast hanging down chest, and her hips are covered with a tiger-skin. A long necklace of severed human heads adorns her body. In her right hand she waves an impaled and upright human corpse. With her left hand she despatches a female wolf messenger. Ekajati stands in the 'pratyalidha' or warrior pose. 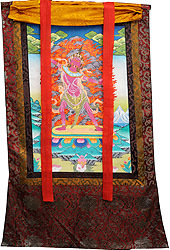 Ekajati is the supreme protectress of the Nyingmapa practices. She also functions as guardian of mantras - preventing them from being disclosed to those unworthy to use them, and ensuring that those who have been empowered to use them do so for appropriate purposes. She guards them in a more general sense as well, preventing them from losing their power and efficacy, or from being lost altogether.